This refreshing peach sorbet recipe is the perfect way to use up that last basket of peaches from the farmer's market. The ease of preparation along with the fresh from the orchard flavor makes this peach sorbet a classic favorite for family reunions and other social functions. 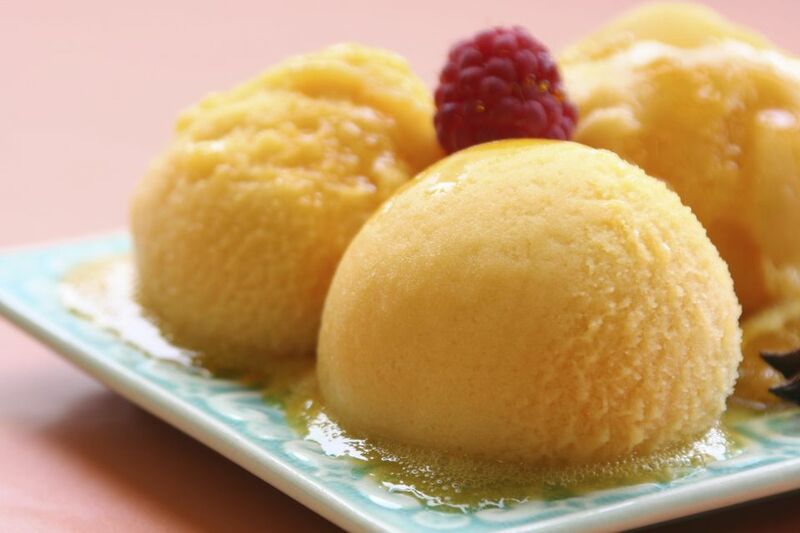 If you don't have access to fresh peaches, frozen peaches create a delicious sorbet as well. Note: If you plan to use frozen peaches or firmer, out-of-season fruit, increase the amount of sugar from 2/3 cup to 3/4 cup. Bring the sugar and water to a boil in a large saucepan over medium-high heat. Continue boiling the mixture for 4 minutes. Add the peaches to the boiling simple syrup and cook over medium heat, stirring frequently (5 minutes for a fruit of average ripeness, or 3 minutes for overly ripe fruit). Remove the peaches and sugar syrup from the heat, stir the lemon juice and zest, and allow it to cool at room temperature for 5 to 10 minutes. Puree the mixture until it is smooth with a food processor or immersion blender. Allow the peach puree to cool and then freeze it in an ice cream maker according to the manufacturer’s instructions.